If you know how to create Windows applications using C#, you’re ready to learn Web Forms programming with our classic ASP.NET book. It will get you off to a fast start whether or not you have done any web programming. It will teach you the skills you need to develop bullet-proof web applications on the job. And when you’re done, this book does double duty as the best on-the-job reference that money can buy. Simply put, Murach’s ASP.NET is a great book. The author does a fantastic job of walking readers through the fundamentals, making the process feel like you’re sitting down with a skilled instructor who’s moving you from one example to the next." To get you off to a fast start, this 5-chapter section shows you how to use Visual Studio to design, code, and test multi-page Web Forms applications that get database data and manage session state. Along the way, you’ll see where HTML5/CSS3 and Bootstrap fit in, so you can tweak that code as needed. This is the essence of ASP.NET Web Forms programming, and this prepares you for rapid progress in the sections that follow. This section teaches you how to use the rest of the server and validation controls that aren’t covered in section 1…more about state management…how to build and format pages using master pages…more about using Bootstrap for responsive design…how to make a site easy for users to navigate…and how to use friendly URLs that improve search engine results. These are the features that you’ll use all the time. In this section, you’ll learn how to use SQL data sources and five ASP.NET controls…GridView, DetailsView, FormView, ListView, and DataPager…to develop professional database applications with little or no C# code. Then, you’ll learn how to use object data sources and model binding with the Entity Framework to create 3-layer applications that separate the presentation code from the data access code. In this section, you’ll learn skills for polishing up your ASP.NET applications. Like: how to secure an application…how to authenticate users with ASP.NET Identity…how to handle back-button refreshes…how to send email…and how to deploy a web application on a remote web server. This section shows you how to use ASP.NET Ajax to develop rich Internet applications. It shows you how to create and consume WCF and Web API services. And it introduces you to ASP.NET MVC, a completely different approach to web programming than Web Forms. If you have a core set of C# programming skills...the kind you get from a book like Murach’s C# 2015...you’re ready for this book. In fact, we’re confident that it will teach you ASP.NET faster and better than any competing book. That’s true whether you’re new to web programming or whether you’re coming to it with a background in another server-side language. This edition adds information about how to use Bootstrap, a framework for designing websites and web applications that’s especially useful for responsive design. You’ll find a brief early tutorial in chapter 3 on the Bootstrap grid system and how to work with forms. Then, chapter 10 is devoted to teaching how to make Bootstrap work with ASP.NET. This edition adds a chapter to the database programming section (chapter 18) that shows how to use model binding with the Entity Framework. This allows binding of a data control like a GridView control directly to an object in the Entity Data Model, rather than having to use a SqlDataSource or ObjectDataSource control. In the 4.5 book, the chapter on authentication focused on the Membership system and the Web Site Administration Tool, but these are gone in Visual Studio 2015. So this chapter now focuses on how to use ASP.NET Identity, which is the replacement for the Membership system. Although the new Identity system is extremely versatile, it can also be hard to understand. So the 4.6 book focuses on what you need to know to use Identity to authenticate users and work with roles. The earlier editions of this book showed how to develop web site projects because they were simpler. Now, however, Microsoft recommends web application projects for new development…and some features like FriendlyUrls are available only in web application projects. So the 4.6 book focuses on how to work with web application projects. This edition adds a discussion about how to use BrowserLink and the Diagnostic Tools window in the debugging chapter. Bootstrap doesn’t work very well with ASP.NET themes, so the chapter on themes (the old chapter 10) has been removed from this edition. The routing chapter in this edition adds a discussion about how to use the FriendlyUrls feature and how to integrate it with ASP.NET routing (they are two different systems, and it can take some tinkering to get them to play well together). Also, the menu server controls don’t work well with Bootstrap, so they’ve been removed from this chapter. The Bootstrap chapter, though, shows how to work with navbars and breadcrumbs. Configuration and deployment Since the Web Site Administration Tool is gone in Visual Studio 2015, that part of the deployment chapter has been dropped. Now, the deployment focus is on how to use the one-click publish feature. To develop ASP.NET Web Forms applications, you can use any of the full editions of Visual Studio 2015. These editions come with everything you need, including Visual Studio, C# 2015, a built-in web server called IIS Express that’s ideal for testing ASP.NET applications on your own computer, and a scaled-back version of SQL Server called SQL Server Express LocalDB. For a no-cost alternative to the commercial packages, you can download Visual Studio 2015 Community Edition from Microsoft’s website for free. It too provides all of the items listed above, it’s a terrific product for learning how to develop ASP.NET applications, and both the applications and the skills that you develop with it will work with any of the full editions of Visual Studio. 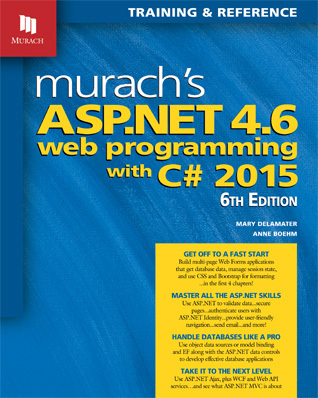 Murach’s C# 2015 is the perfect companion to our ASP.NET 4.6 book. It presents the C# programming skills that you need for developing ASP.NET Web Forms applications. It works for beginners as well as professionals. It lets you learn new skills whenever you need them. And it’s the best on-the-job reference that money can buy. "Simply put, Murach’s ASP.NET is a great book. The author does a fantastic job of walking readers through the fundamentals, making the process feel like you’re sitting down with a skilled instructor who’s moving you from one example to the next." "Another awesome book from Murach. I have always been a fan of Murach’s books; I learn so much more from them than any other tech books out there. The format makes learning new materials easier, and their code examples WORK." "Great book. Probably the best there is on learning ASP.NET C#. Seriously. I’m hard to please, and as a programmer and engineer, I was surprised by how informative this book was." What is a friendly URL? This chapter gives you the background you need to start writing ASP.NET 4.6 Web Forms applications of your own. So you’ll find out how web applications work, what software you need to develop them, and how the code that represents the design of a web form is coordinated with the C# code that makes the web form work the way you want it to. This chapter teaches you how to use Visual Studio 2015 to design, code, and test a one-page web application. That means you’ll see how to build a web form using web server controls and HTML server controls, how to check for acceptable user input using validation controls, and how to write the C# code for the web form’s code-behind file. This download is referred to in the book as ac46_allfiles.exe. It’s been split into two because of its size. The appendix in the book describes how to install and use these files. There are no book corrections that we know of at this time. But if you find any, please email us, and we’ll post any corrections that affect the technical accuracy of the book here. Thank you!